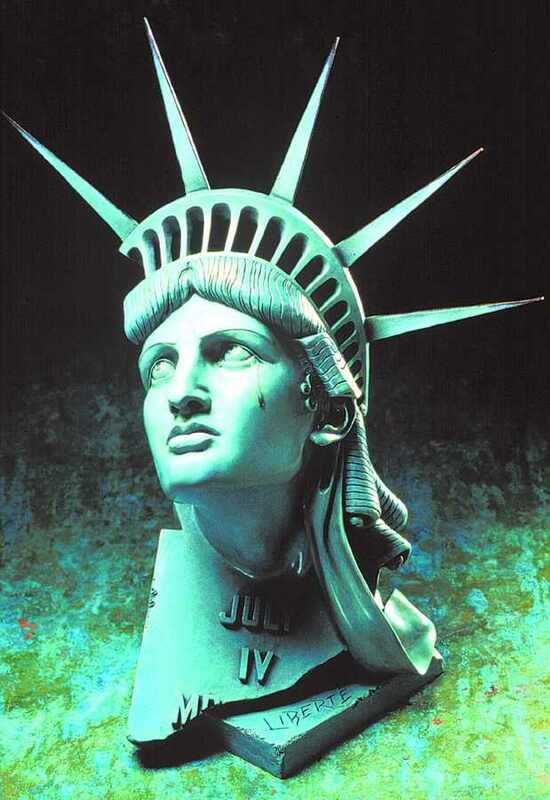 The Lady of Liberty's eyes gaze imploringly heavenward in the direction of Freedom's Torch-is it truly still there and still lit, or does the tear on her cheek speak profoundly of a prospect yet to be revealed? Human liberty itself has been eroded from within until it is but a mask of the former glory and veneration in which it was held by our founding fathers. The spiritual seventh ray of her crown has already been rent asunder. The sixth ray of responsibility has fallen through neglect, yet-as a warning to would-be tyrants-it still lies clutched like a dagger of Truth behind the backs of an enlightened people. "O, awaken, ye sons and daughters of Despotism. Look ye behind, for ‘we the people' gaineth on you."